A son proved a New Year’s Day nuisance to his mother when he kept being rude to her. Jack Evans kept getting out of bed and being abusive to his mum even though police had told him to stay put. Evans, 22, of Ribble Road, Blackpool, pleaded guilty to breach of the peace. Prosecutor, Tracy Yates, said police were called by Evans’ mum to their home on January 1 at 7.30am. His mother told officers he kept being abusive to her and she believed he was drunk and had taken Ketamine. Evans was found in bed and told to stay there and behave, but he came down and was rude to his mum. He was told to go back to bed and an officer stayed at the address. Five minutes later Evans was back being abusive again. Suzanne Mugford, defending, said her client’s mother was in court to support him and he apologised for his behaviour. Evans had mental health issues and had been self-medicating with alcohol. He was soon beginning a plastering apprenticeship which would be a fresh start for him. A man lost his temper on New Year’s Day and repeatedly stabbed a wooden table at his former partner’s hotel in Blackpool. Dean Barr had been with his partner for 18 years but they had split-up a couple of months ago and the defendant had returned to help his ex out over Christmas. 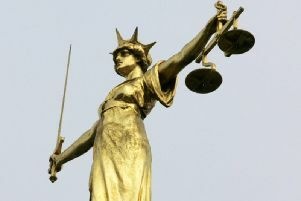 Barr, 41, of Station Road, Northfield, Birmingham, pleaded guilty to causing damage. He was given a 12 month conditional discharge and ordered to pay £60 compensation plus £20 victims’ surcharge. Prosecutor, Tracy Yates, said police were called to the Vienna Hotel, Banks Street, on January 1 at 4.45am. Barr and his ex had argued after the defendant went out with his friends and then returned and tried to get into the hotel bar. He had become aggressive, waving a knife around and then repeatedly stabbed it into a wooden table. When interviewed Barr told police he became angry and lost it but he had no intention of using the knife on anyone. Steven Townley, defending, said his client had helped his partner run the hotel in Blackpool but when they split-up Barr went to live in Birmingham. He had returned to help his ex over the festive period . Barr had already spent more than 30 hours in the cells. A woman turned on her ex-husband hitting him twice outside their former home. Kelly Hargreaves was found guilty in her absence when she failed to turn up for a trial. But she did turn up at court to be sentenced. Hargreaves, 44, of Peregrine House, Poulton, was given a one year community order. She must undergo 25 days rehabilitation. She was also made the subject of a one year restraining order forbidding her from contacting her former husband or his mother. She must also pay her ex husband £100 compensation and not enter the road where he lives. The court heard that the friction between the couple resulted in their children being placed in the custody of the husband. After she failed to turn up to a welfare meeting about the children, Hargreaves came across her husband at a petrol station. The next thing he knew was that when he got home she was going through mail in his hallway. Outside the house Hargreaves landed two blows on her victim. Her lawyer Brett Chappell said: “She still says this assault did not take – she does not accept being found guilty and will be appealing. A man charged under new laws brought in last year involving attacks on emergency workers has made his first appearance at court. Sean Wharton faced four charges of assaulting an emergency worker, all police officers, under the Assaults on Emergency Workers Act 2018. Wharton, 34, of Withnell Road, South Shore, Blackpool, pleaded guilty to assaulting two police constables by spitting at them. He denied assaulting two police officers one by kicking out at him and the other by tripping him up and assaulting a door security officer. The offences are said to have taken place between Saturday and Sunday. Prosecutor, Pam Smith, said the case was suitable to be heard by magistrates. Wharton was bailed to March 22 for trial.